One of the most important feature for a pilot watch is the presence of bright lume for reading the time in darkness or poorly lit environment. The original material used for making the hands, numbers and marker, and the triangle at 12’o clock, was Radium. Radium was highly radioactive and had adverse effects on those manufacturing the dials, as well as wearing the watch. Radium was replaced with Tritium in the late 1960’s and early 1970’s. While Tritium was much safer radioactive material than Radium, its properties to glow did not last more than 12.5 years, and still was not 100% safe. Hence, Luminova was invented in 1993 by Nemoto & Co., Ltd. of Japan as a safe replacement for non-radioactive luminous paints. Nemoto licensed Luminova technology to RC Tritec AG of Switzerland, whose renamed it to SuperLuminova, which is now adapted by majority of the watch companies. 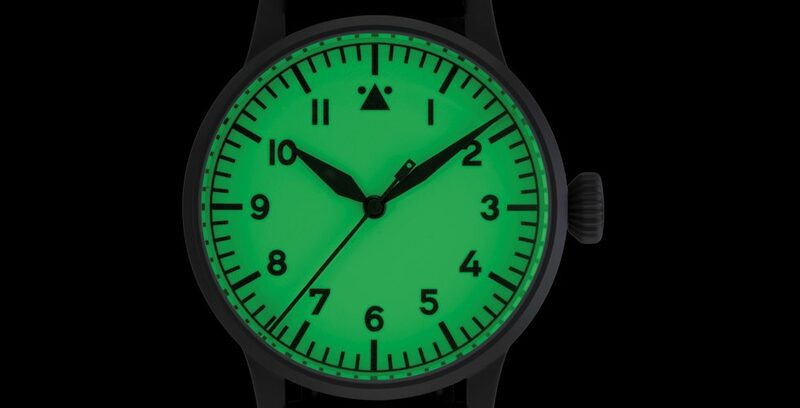 While majority of the pilot watches use SuperLuminova on the dial and hands, there are few watches which reverse this process by applying the entire dial with SuperLuminova and making the hands and numbers in either black color or with different color shade of luminous paint. In past, Heuer manufactured sports watches with full lume dial, and recently Muhle Glashuette, Chronoswiss, and Fortis. 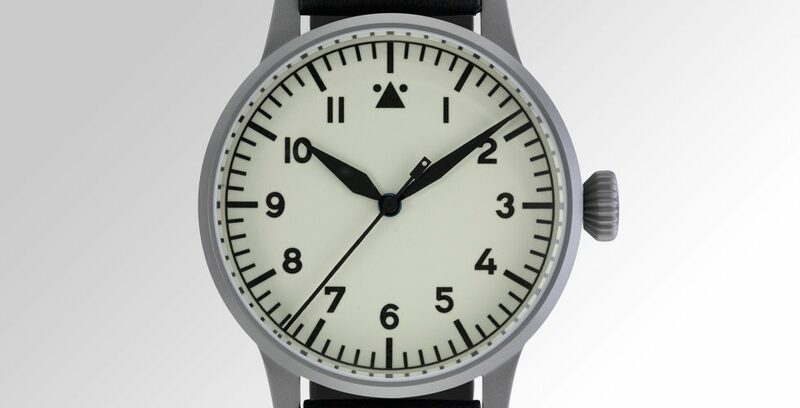 However, currently the best examples of full lume dial is offered by Laco, Aristo, Damasko, and Junkers. 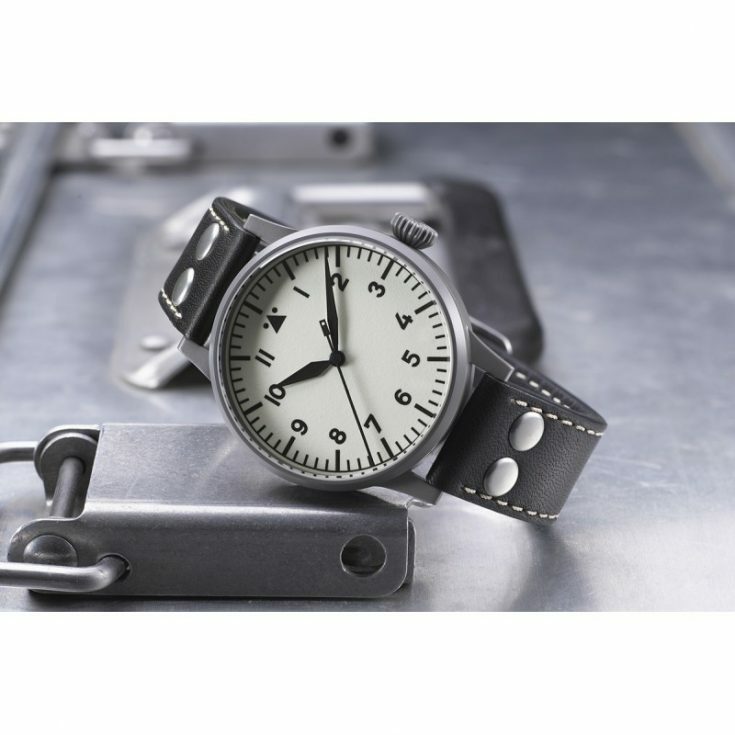 Laco is one of the original five flieger manufacturer based in Pforzheim, Germany. During the WWII, Laco manufactured the famous 55mm flieger with the large Durowe D5 pocket watch movement. Venedig comes in both Baumuster A and B dial configuration. 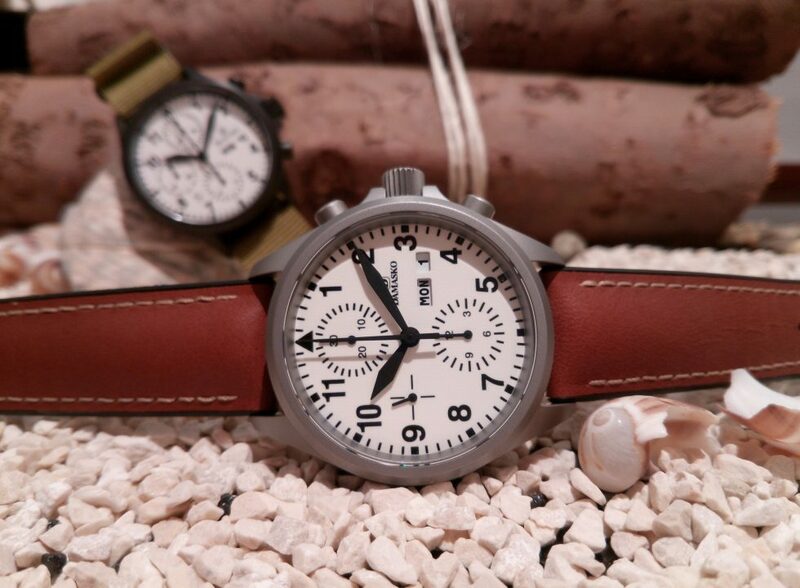 Laco’s sandblasted stainless steel case with “FL23883” engraving is a very close replica of the original flieger. The case diameter is 42mm, and the height is 13mm, with the lug width measuring at 20mm. It has a domed sapphire crystal with an anti-reflective coating and a big diamond crown. 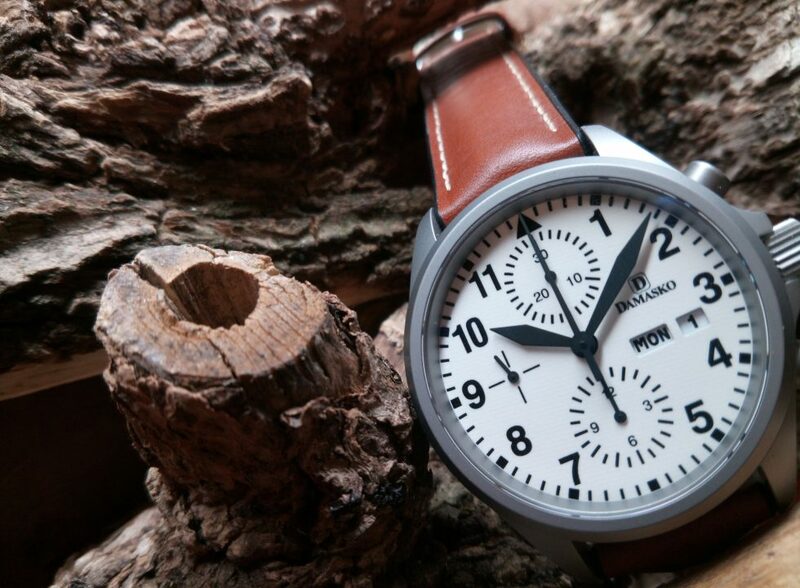 True to the historical flieger, it has a solid case back with special engraving. The all lume dial of Venedig is coated with Superluminova C3 and the hands and numbers are in black color. The watch is powered by workhorse ETA 2824-2 Elaboré grade movement. It is waterproof up to 5 ATM. Retail price is $1,190 USD and it is available direcly from Laco website. The Aristo Uhren and Uhrgehäusefabrik (Aristo watch and watch case manufacturing) was founded in Pforzheim, Germany in 1907 by Julius Epple. In 1998 Helmut Epple, the grandson of the founder, appointed the watch designer Vollmer as his successor. In 2005 Vollmer merged Aristo and his own family business to form the Aristo Vollmer GmbH. 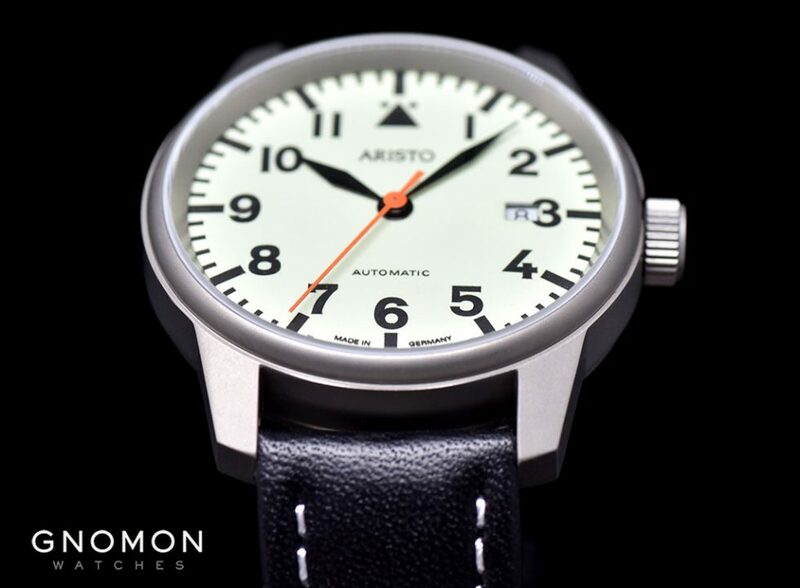 Currently Aristo offers low-priced pilot and sports watches based on the Swiss ETA and Sellita automatic movements. The 5H70Ti has a grade 5 titanium sandblasted case, measuring 41mm in diameter, and 10.5mm in height. The lug width is 20mm. The titanium case is made up of two parts; the combined mid case and bezel, and the screw down case back. The front has a flat sapphire crystal and the display case back reveals the ETA2824-2 movement. The all lume dial has SuperLuminova coating with black numbers, markers, and hour and minute hand. The seconds hand is a striking orange color. The date window is at 3’o clock. Aristo 5H70ti comes on a black leather strap with a titanium buckle. Retail price is $490 USD and it can be purchased from Gnomon Watches website. Last week we reviewed the Damasko DC 56 chronograph in-depth. DC 57 is the all lume dial with the same configuration as the DC 56. It has the ice-hardened bead-blasted stainless steel case with an integrated anti-magnetic inner cage, anti-magnetic to 80,000 A/m. The case diameter is 40mm with a 13.70 mm height. The crown system has also patented by Damasko. Crown and pushers are also hardened and all gaskets are made of Viton. The all lume dial is coated with Luminova C1 white, and the numbers, markers, and triangle at 12 o’clock are painted matte black. All the hands, including chronograph sub-counter hands, are painted in matte black. The crystal is a flat sapphire crystal with highly scratch resistant anti-reflective coating on both the outside and the inside of the crystal. The watch is powered by Valjoux 7750 automatic movement. 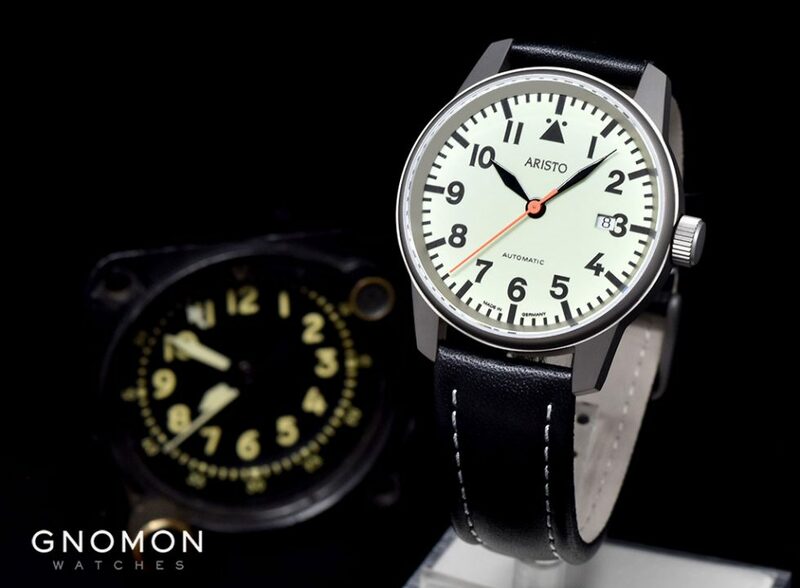 Retail price is €1,840 (including 20% German VAT) and it can be purchased directly from Damasko website. POINTtec is a medium size watch company based in village of Ismaning, not far from Munich in Germany. Wilhelm Birk founded POINTtec in 1987 where they have been producing watches under Junkers, Zeppelin, Maximilian München, and Rosenthal. Their annual output of 150,000 watches makes them one of the largest watch manufacturers in Germany. They private label for BMW Museum, Honda, Bosch, Siemens, Audi, Volkswagen, and many others. 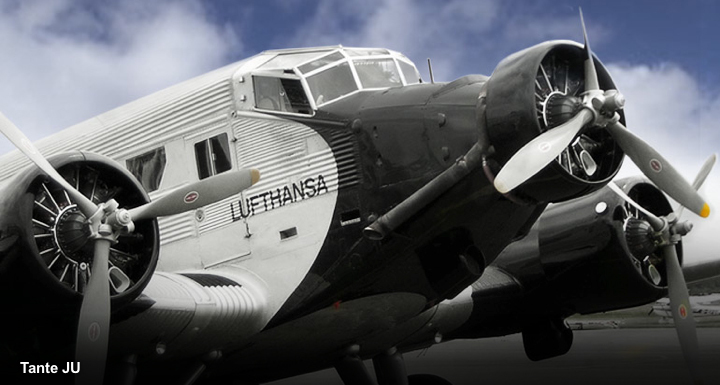 Junkers is trademark of POINTtec to pay homage to the 1931 the BMW made three-engine passenger airplane Junkers JU 52, which was in use for decades for Lufthansa and several other airlines worldwide. Tante JU which translates to Aunt JU was once considered the safest airplane in the world. 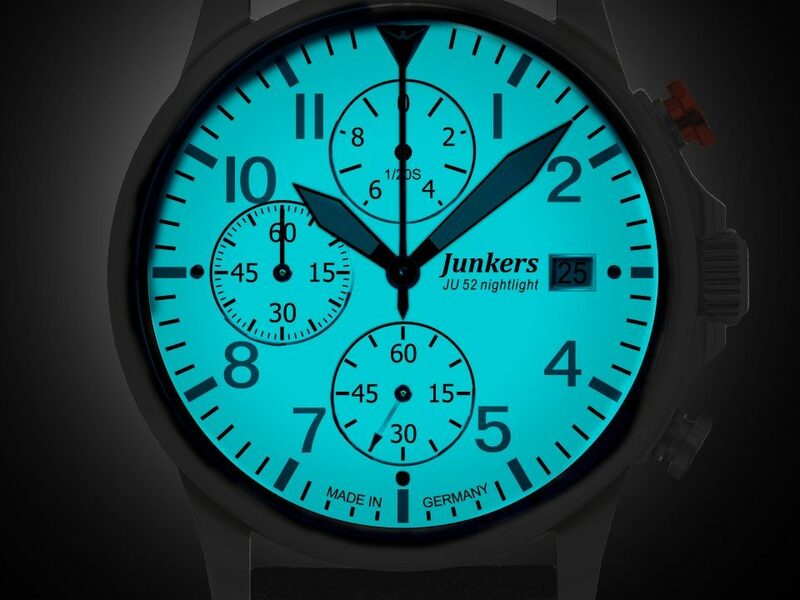 The 6872-5 Series Tante JU watch features Superluminova coated dial with anthracite numbers and markers, and black hands. 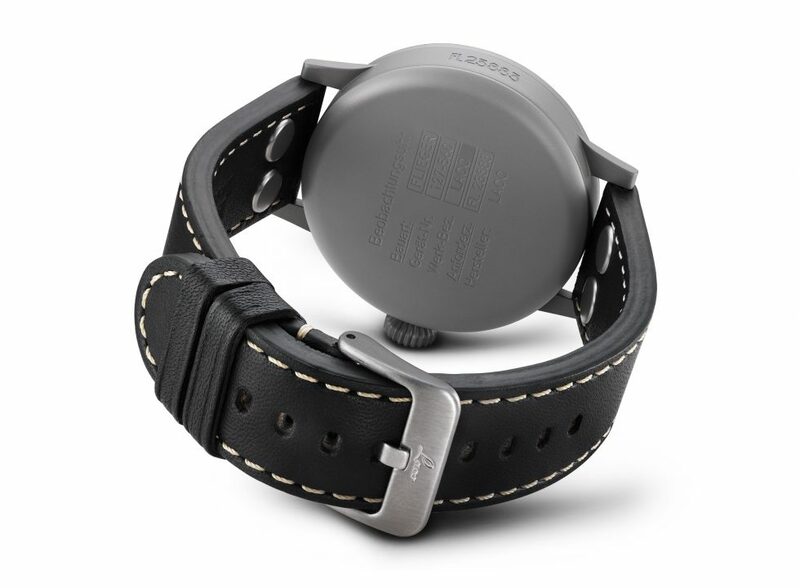 The stainless-steel case has a satin finish and coated with PVD. The case diameter is 42mm with 12mm height and a mineral crystal. The complications on the dial consist of central chronograph hand, thirty-minute counter, sub-second counter, twelve-hour counter, and day-date indicator. The watch is powered by Miyota quartz movement caliber 6S10. Tante JU is water-resistant up to 10 ATM. 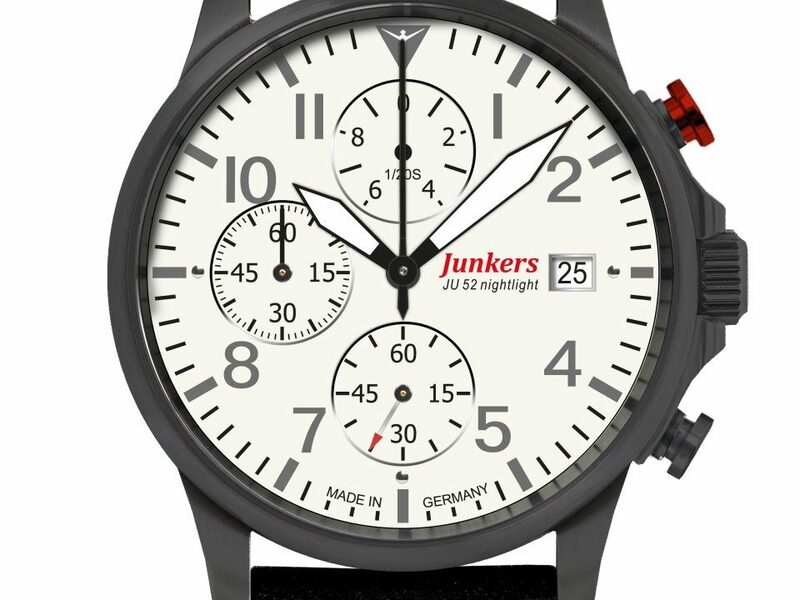 Retail price is 299.00 € (including German VAT) and it can be purchased directly from Junkers website.